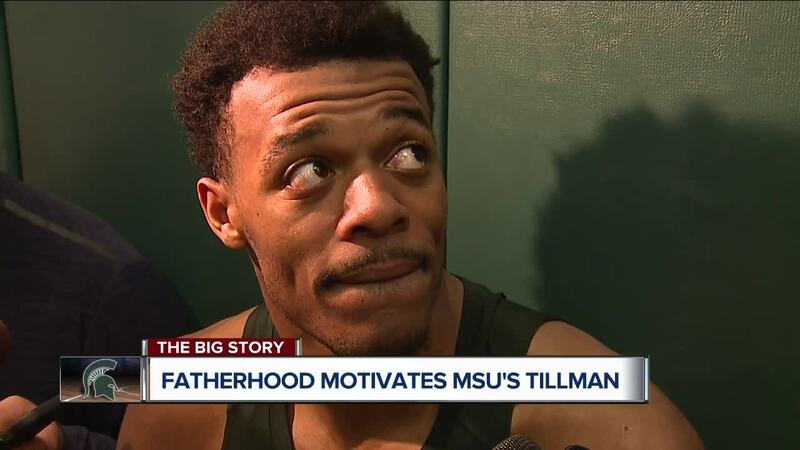 Fatherhood motivates Michigan State's Xavier Tillman. Brad Galli has more from Minneapolis at the Final Four. Xavier Tillman has talked a long time this week about losing weight, getting into the best shape of his life, and life as a father. Those are the aspects of his life that have defined his journey to the Final Four with Michigan State. This week, they are highlighted even more. Tillman does have basketball ranked pretty high in his day-to-day priorities. But even the game that he loves can’t top his No. 1 priority. “Nothing is more important than being a father,” he said this week. Tillman is 20 years old and a big part of Michigan State’s run to college basketball’s big stage. Ayanna is Tillman's daughter with his fiancé, Tamia Todd. The two-year-old with a big smile was a big part of every MSU celebration this season.